This grab-and-go live rig is ready to take your music to the masses. 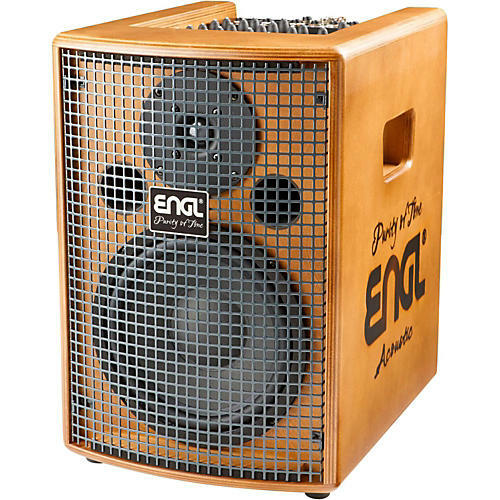 The ENGL A101 is a 150-watt, all-round acoustic amplifier, designed to fulfill the needs of every performing artist. This amp is not only for acoustic guitars, but also for vocals and all other acoustic instruments. It is even possible to connect instruments with higher outputs to it like keyboards. This makes it the perfect tool for smaller gigs and even makes rehearsing wherever you are a totally new and impressive experience. Meet at your friend's house, connect one or two guitars (Channels 1-3), a mic (Channel 1-2) or maybe a keyboard (Channel 3) to the A101, and start practicing with a sound that gives you the feeling of being live on stage. Invite some friends and play a living room gig with the ENGL A101. You need nothing else. Even when you play at a bigger venue you can easily use the Rec Out and connect it to a second A101 so that everyone will be able to hear you loud enough. Channel 4 of the A101 gives you to the possibility to keep the party going on all night long after your gig by simply connecting an MP3 player to it. You can also use this Channel to play along to your favorite songs. With its warm and rich midrange and smooth and silken treble, the A101 delivers an organic sound. It is equipped with four different effects, which top off the many possibilities this amp offers. The natural and sophisticated design of the A101 focuses on an extensive appeal and due to the real branding on the sites, every amplifier is as unique as you are, the artist who is using it! Dimensions: 11 in. x 16.1 in. x 14.5 in.